There were no winners today, including me--because I still had to see Grayson talking and cooking. Glad to see Giselle acting like an executive chef; at least she retires to her folding chair with dignity. Really looking forward to someone taking Grayson down, especially given that the chefs who remain in the competition could probably have defeated any of the chefs from the Texas season (with the possible exception of Paul). Salty Tom is always enjoyable. So at least there was that! I've never seen them before, but I imagine those broad beans are similar to those dried edamame that are a snack food. Which does seem like a tough ingredient. Coconut seems a lot easier. Tom, Giselle, and Grayson were all being really playful and were in high spirits. I think Tom has figured out how to make Last Chance Kitchen feel loosey-goose and fun. I loved when he was giving an interview to the camera about Giselle plating too early, and Giselle shouted "I can hear you, chef!" and scooped the polenta back into the pan. Did he intentionally do that for her benefit? Tom seems willing to puncture and lampshade a lot of the faux-seriousness of the main show. Even when Giselle lost, she thanked Tom and said it was fun. It looked fun! People kicked off the main show never say they had fun. But the lightheartedness might be due to the fact that no one in these early stages expects to go all the way, so the competition doesn't feel as cutthroat. That's a great point, painquale--chefs have an obsession with teaching people, for one thing, and sometimes that means gentle reminders like not plating too early. Plus, no matter how good you are, there's still someone you refer to as Chef, and Papa Bear Tom is who he is. Also, bleeped out but Grayson's "shitting ballsack" is now entering my vocabulary. She's pretty clearly going to make it through LCK. I like Grayson when she's on the show, but she's in top form on LCK...maybe not necessarily as in the competition, but she wears chef-with-nothing-to-lose like a badge of honor, and she's as entertaining as a chef on this show can get when she's expressing, in words and acts, how she's sweating the task. It's entirely possible she does this in every quickfire and they just edit out her exuberance for time until it's time for her downfall episode, but I love LCK's focus on two chefs alone and she shines in the spotlight...as spectacle as well as a chef. She may not always be around for cheffing on this show, but she'll always be amusing. I wonder if they get their ingredients pre-washed. When I see stuff like Wesley chopping herbs that still have their twistie tie on, I worry. It's been bugging me that he's stayed on the show since the first or second episode when he served the judges a blended up fruit sticker (which also indicates it wasn't washed with care). If they had known they were eating a sticker, he would have left that episode. IIRC, on Top Chef Canada ingredients inside the studio would be as the chefs would expect to find in their own restaurant kitchens--veg/fruit/herbs would be cleaned and ready to used. Proteins could go either way, depending on the challenge. (I was not on TCC but a chef I worked for was). Ingredients bought from stores would not be. Not a huge fan of the burger challenge. Seemed to boil down to how good you were at forming your patty. I see it as a pretty good challenge, actually. The first hurdle is purely technical: can you form a proper patty and cook it perfectly? At their level, the technical prowess is more or less a given. Angelina took a bigger risk keeping hers more med-rare than med, and nailed it--check Tom's expression. Getting a burger to that level of doneness is a pretty knife-edge trick; slightly too little and it's obviously rare which is undesirable in a burger, rest it thirty seconds too long and it's not quite the perfect even pink of a medium, which shows that you've overshot the mark. By contrast, getting it anywhere between medium and medium well (brown with a hint of pink at the centre) is perfectly acceptable and easier to fudge. Tom missed a trick, though, by not asking them the doneness of their burgers before cutting into them. I suspect the winner might have been different if he had. (Wesley's looked fantastic, Grayson's looked like she went for just medium and undershot by a minute). So the real part of the challenge, assuming the technical aspects are hurdled, is the artistry. For me, Angelina won hands down on that score, delivering a variety of flavours and textures that sounded like they'd go really well together. Grayson did her usual down home grub thing (don't get me wrong, I love down home grub and would eat her food with gusto), and Wesley went pretty classic but without any sort of pizzazz. On both counts, Angelina took greater risks and nailed them. I don't know how Tom judges the LCK contests specifically (does he have a score sheet he fills out? I dunno), but seems to me like it's akin to judging gymnastics: take the bigger risk and land it, and you automatically get more points than someone who executes something simpler and equally flawless. Man, those Jason vs. Chad meals both looked great. Tom was in heaven. You rarely see him that excited about food outside of LCK. Phillip shouting "Medic!!!!" and expecting someone to race over instantly (like they were just waiting in the wings for someone to cut themselves?) and his constant blaming of other people ("Who moved my gloves????" Uhhhh dude, had to be you. There are only two people - working individually - in this kitchen) really crystallized why he BOTHERS me so much. I know I've said this before, but... Phillip's constant scoffing about how he's not here to cook food for the judges, he's just going to do the food that he knows is amazing, screw everyone else--it really reminds me of the Profound Butthurt of George Walton Lucas after the success of The Force Awakens ("well sure, if you want to make a movie that'll make the fans happy..."). Anyway, this was a fitting end for Phillip. 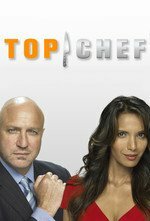 I enjoy LCK Tom Colicchio. He's much more at ease and approachable, yet still refuses to be bullshat. Phillip goes out at his peak Philliposity, and Tom clearly can't take him anymore, which is hilarious. I love that this showdown was based around Phillip's reputation for whining: even if he'd won, he'd have looked like the whinge-iest contestant ever to walk through Top Chef's doors, and that's saying something. And then he lost! And his food looked terrible! And now he'll be muttering from the sidelines the entire time--where he belongs. Non-competition Colicchio is high-larious. He's basically a giant goofball when it's not "yes, chef" and "no, chef". I love it. SO glad to see that tattooed dingbat turfed. Awww. Aw. I was really sorry Karen didn't win. I was hoping she'd make her way back into the competition. That said, Jason is clearly hitting his stride, and he's growing on me. Also, I think drag teppanyaki is an excellent idea.